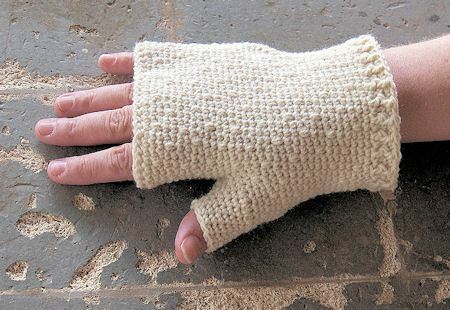 When I received the yak down yarn from Bijou Basin, the creamy color just begged to be made into warm mittens, with snow flakes floating down the back of the hand. Of course, you can always come up with your own design by placing the “snow” stitches in squares, diamonds, or evenly spaced for a more solid pattern. I’ve even provided you with graphs so you can chart out your own design! Plus, if you prefer a fingerless version (or only have one skein of the yak yarn) I’ve included modified instructions at the bottom of the pattern. US G/6 (4.0 mm) or size needed to obtain gauge. 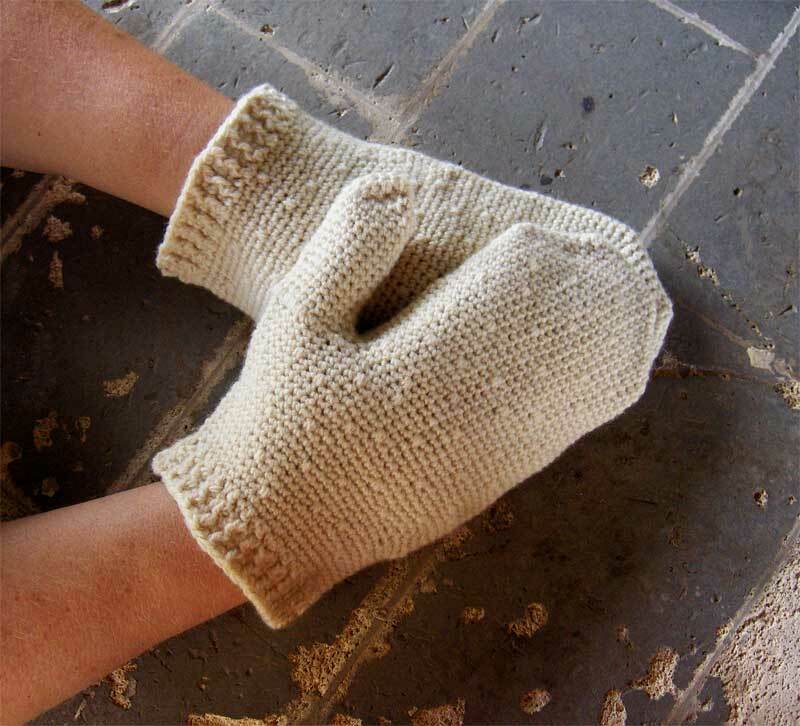 Except for the cuff, the entire mitten is worked in rounds. Do not join unless directed to do so. Use fewer “snow” stitches if you have a limited amount of yarn, or, if using a colorway that doesn’t look well with the “snow” stitches, eliminate them altogether. The snow stitches are made by working the sc into the space of the row below. 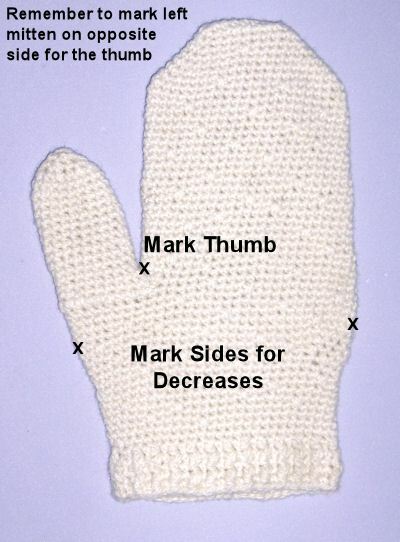 No specific instructions are given for placing the snow stitches, just place them randomly on the back (right side) of each mitten or use the provided graphs to design your own pattern. Remember, the more “snow” you have, the more yarn you’ll need. Note: Crochet over the yarn end as you sc in the back loops. This will strengthen the sts by allowing you to crochet over two strands instead of just the one back loop. NOTE: Move markers up as you go. On round 3, make a “snow” stitch just before the center on the right side. Continue until there are 46 (50, 54) sc, adding “snow” stitches randomly on the RS as you go. Rounds 34-38 (37-41, 37-41) Sc in each sc around until you reach the chs, sc in each ch, continue making scs in each sc around for four more rounds, remembering to add “snow” sts on the RS as you go. 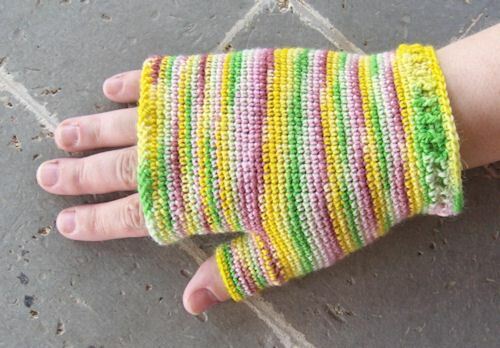 Note: The opening will be a little loose but since the yarn doesn’t stretch much, you won’t be able to get it over your hand if the cuff is too tight. If using a stretchier yarn, you can decrease using four sc2tog spaced evenly around on the last one or two rounds. Round 54 (57, 57) Ch 1, sc in same sc, pm in sc (move up as you go), *dc in next sc, sc in next sc,* repeat from * to * around, ending with a dc, join with sl st in first sc (skipping ch 1). Round 55 (58, 58) Ch 1, sc in same sc and in ea st around, join with sl st in first sc. Round 56 (59, 59) Ch 1, sc in same sc, *fpdc in dc of previous round, sc in next sc,* repeat from * to * around, ending with a dc, join with sl st in first sc (skipping ch 1). Ch 1, sc in same sc, *fpdc in fpdc of previous round, sc in next sc,* repeat from * to * around, ending with a dc, join with sl st in first sc (skipping ch 1). (Optional) If you want the cuff to be longer, repeat rounds 57 and 58 again. Fasten off. Round 1 Join yarn on palm side of thumb, *sc in ea sc around, working sc2tog where thumb joins the palm on front and back* (this decreases ea round by 2 sts). Note: When I made the joining round, I crocheted into the spaces of the row below so that it made a small ridge. If you don’t want the ridge, crochet into the top of the round, which would be the back loop of the thumb hole chain made earlier. Work the tail of the joining yarn into the stitches to strengthen them. Rounds 2-4 Repeat from * to * of round 1. Rounds 5-14 Sc in each sc around. Measure thumb to make sure it is 2″ in length from where it joined the palm. Add or remove rounds as needed to obtain length. End Rounds Sc in next sc, *sc2tog, sc,* repeat from * to * around until 2 or 3 sts remain. Fasten off. Weave in ends. Use tail on thumb to close the small hole at the tip of the thumb. Wash and block as needed. Round 1 Ch 47 (51, 55), sc in second ch from hook and in ea ch across, join with sl st to first sc. Note: Use a sc foundation row for a nicer beginning to the glove. Round 2 Sc in each sc around. Fold piece in half and pm in st at ea side. Mark top as RS for right mitten, mark bottom as RS for left mitten. Round 3 Sc in ea sc around, making at least one “snow” st on RS. Rounds 4-15 (4-19, 4-19) Sc in ea sc around, making “snow” sts on RS as you go. 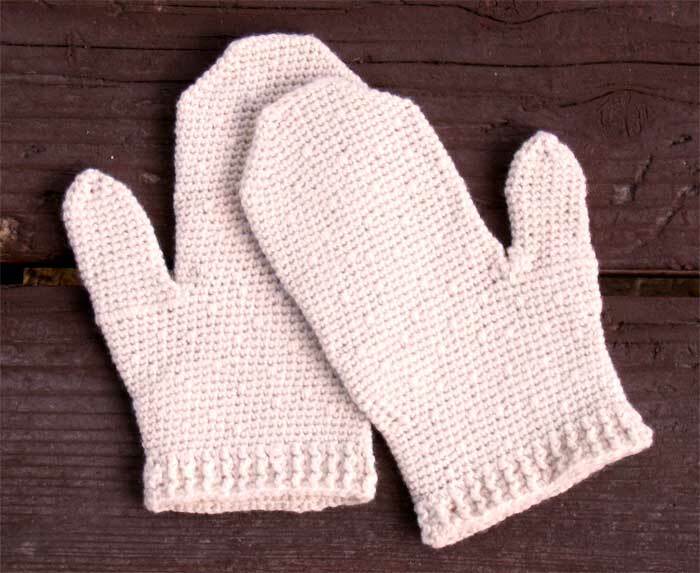 Follow instructions for full mitten. Follow rounds 1-9 (or rounds 1-7 if you have a short thumb like me) of full mitten thumb instructions. Fasten off. additional rows in order to get the length and shaping correct.